Moving from one home into the other can be a stressful undertaking. Being more organized can go a long way and make the moving process a much better experience. Obviously, one of the best ways to help with that is hiring the right moving company. Another way to tackle a successful move is to be prepared in advance by decluttering your home. You can lower your moving costs and time due to having fewer items to pack and haul. You will have less work after the move; having less to unpack and sort upon arrival to your new home and locating packed items will be much easier. they do not fit you, and you do not want to or cannot have them altered to fit. they are out of style for your current taste. they are too worn out or otherwise ruined. you do not like them anymore for any reason whatsoever. As long as your clothing is in a good condition, you can sell them online. Selling clothing can be simple if posted on sites such as thredUP, Poshmark or eBay. A local alternative could also be a consignment store, or Facebook market page. However, if you do not want the hassle of selling your clothes or prefer to combine your wardrobe purge with a charity, consider donating them to an organization of your choice, such as Goodwill, or another thrift store or charitable organizations that accept clothing donations. Many old pots and pans, especially those that are not well-maintained or of a cheaper quality, tend to get somewhat unsightly after a while. If that is the case, or if you simply want to reduce the amount of your old cookware, upgrade to different materials etc., a move is an ideal opportunity to decide what to keep and what to get rid of. Depending on the condition of the items, you can donate them to a charity organization, or even try to sell them (online/offline). 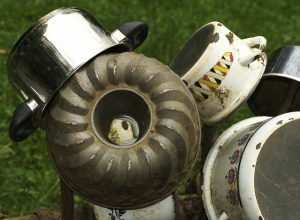 While the trash can seems like an easy option for some of your old pots and pans, recycling might be a better option (scrap metal). However, most curbside recycling programs do not accept such recycling items, so you might need to put a bit more effort into it. Have a look at this article to find out more about how to recycle used cookware. These are only a few of our examples. For better move organization, find out more about what to do with your purged items in next week’s post!